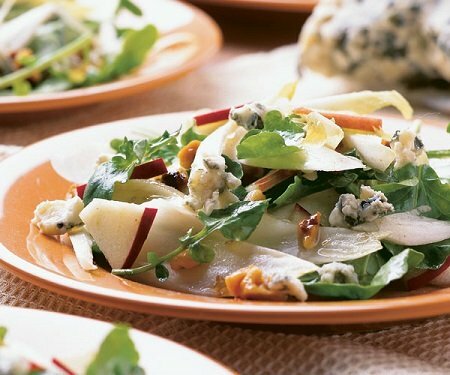 This restaurant Endive Salad Recipe is a favorite restaurant salad recipe because of the combination of apples, walnuts and crumbled Bleu cheese with vinegar and oil dressing. 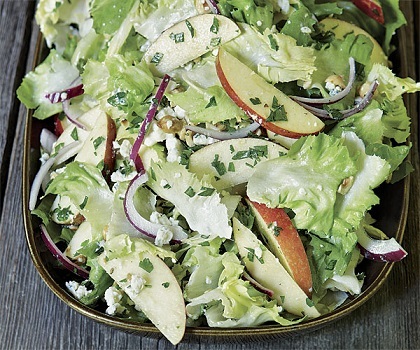 Everyone at the restaurant loves this salad, especially when fresh Washington State apples are abundant. Endive is good and good for us. Endive is a versatile performer in the kitchen. Endive is a nutritional "powerhouse." It is loaded with valuable vitamins and minerals. Eat endive as often as you can in a variety of ways. It is a contributor to your health in many ways. Endive comes in several varieties. Escarole is one many people use because it is slightly less "bitter" tasting than some other varieties. That said, many people prefer the stronger taste of other endive varieties, especially when "matched" with bleu cheese and apples. Preparation time: 20 minutes. Serves 6. 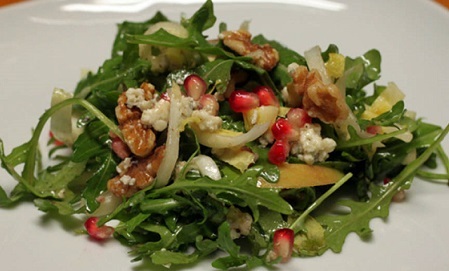 Enjoy your restaurant Endive Salad and the company of those you share it with! Did you know? Genuine Endive is part of Belgian history. These tangy, tender and delicious white vegetables were actually discovered there in 1830. Endive's fame and versatility has spread worldwide. Many cooks and chefs use Belgium endive for a flavorful and hardy endive.